This Biodiversity Action Plan has been prepared by the Burnt Fen Internal Drainage Board in accordance with the commitment in the Implementation Plan of the DEFRA Internal Drainage Board Review for IDBs to produce their own Biodiversity Action Plans by April, 2010. The Plan is an evolving document that will be reviewed and updated on a regular basis. 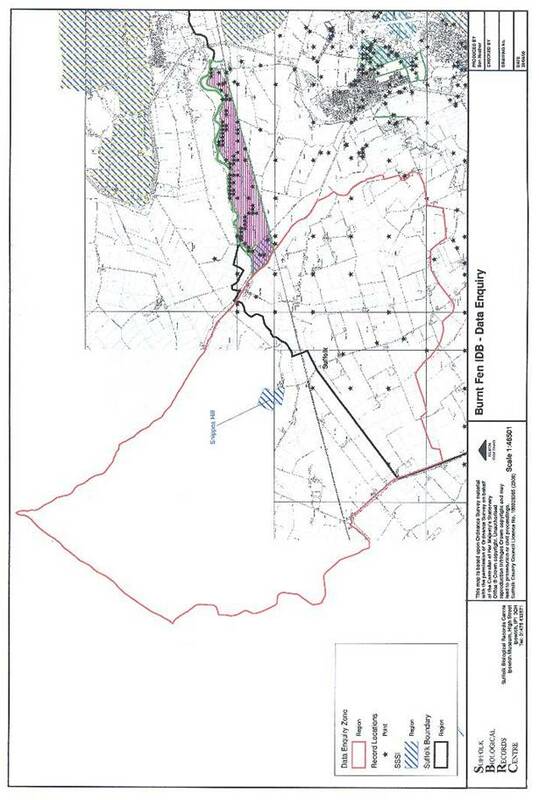 It covers the entire drainage district for the IDB, as shown on pages 5 and 6. The Rio Convention includes a global commitment to achieve by 2010 a significant reduction of the current rate of biodiversity loss at the global, regional and national level The 2002 World Summit in Johannesburg on Sustainable Development subsequently endorsed this target. The Biodiversity Audit covers the entire district of the IDB, as shown on pages 5 and 6. Where data has been obtained that shows a record of a species in a 1km square or 10km square which the district wholly or partially covers, this has been included in the area of the audit. The Drainage District covers an area of 6,935 hectares and contains 63km of IDB maintained watercourses. It is located at the northern most tip of Cambridgeshire, although part of the District extends into both Norfolk and Suffolk. The District forms part of the South Level Fens with the Little Ouse River forming the northern boundary, the Ten Mile River, the western boundary and the River Lark, the southern boundary. Burnt Fen is a mature peat fen where thinning peat deposits mixing with silty clay subsoils produce an extremely good bodied peat topsoil. Much of the District is underlain by silty fen clay. However, there are areas of sand and gravel subsoil. In the Sedge Fen area topsoils are a white marl; the product of deposits in a former shallow lake. The District is criss-crossed with a number of major and minor Rodhams produced by silt deposition in redundant watercourses. Shippea Hill is a “fen island” approximately at the centre of the District protruding some 5m above the surrounding fen. There are no National Parks or Areas of Outstanding Natural Beauty (AONBs) within the Burnt Fen Internal Drainage District. The Burnt Fen Internal Drainage District falls entirely within The Fens JCA. There are no Local Nature Reserves designated by local authorities under Section 21 of the National Parks and Access to the Countryside Act 1949 within the Burnt Fen Drainage District. Arable farmland dominates the Burnt Fen IDB Drainage District. The majority of the District is under intensive arable cultivation, being dominated by large cultivated fields which are of relatively good quality. This is the key habitat influenced by the Burnt Fen IDB. Within the area covered by this BAP, the smallest drainage ditches are managed by private landowners, many of whom will be known to the IDB, and the rest are directly managed by an IDB. Rivers and streams are one of the most intensively used semi-natural habitats in the UK. They convey floodwaters, accept discharges from roads, sewage treatment works and industry; provide water for human consumption, agricultural and industrial use; and are used as a recreational resource for popular activities such as angling, boating and walking. The plant and animal assemblages of rivers and streams vary according to their geographical area, underlying geology and water quality. Lowland, nutrient rich systems as found in Cambridgeshire, Suffolk and Norfolk are dominated by higher plants, and coarse fish such as chub, dace and roach. The major rivers adjacent to the District (managed by the Environment Agency) are Ten Mile River, River Lark and Little Ouse. While main rivers are managed by the Environment Agency, watercourses managed by Burnt Fen IDB are pumped into main rivers and so have an impact on river habitat. Improvements to drainage ditch habitat are likely to contribute to improvements in biodiversity on main rivers. Reedbeds require appropriate cutting and water level management. The Burnt Fen IDB are responsible for reed areas in drainage ditches and are also key partners in water level management for reedbeds in other ditches. There is currently limited information available about open water sites in Cambridgeshire, Suffolk and Norfolk in terms of their conservation status, water quality and importance for biodiversity. Very little survey of the deep water areas has been carried out, and it is possible that the deep waters of lakes contain populations of rare stoneworts. Collecting further information is the key action for this habitat. Open water is an important habitat for water birds, which may be supported in nationally important numbers, especially where there are many water bodies close together. Appendix A lists all the BAP priority species that occur within the Burnt Fen IDB District as identified by the information gathering exercise. Also listed are species deemed to be of local importance and/or identified in the county Local Biodiversity Action Plan that occur in the Burnt Fen IDB District. This species audit summary lists species that are of potential importance for the Burnt Fen IDB, where water level management or other IDB activities may be of benefit. Finally, brief notes are included on the potential for the Burnt Fen IDB to maintain or increase the population or range of species of importance. A large proportion of drainage ditches within the Burnt Fen District support populations of water vole. Where intensive studies have been undertaken, water voles have been recorded in approximately 52% of ditches surveyed. (A total of 84% of the Board’s drains have been surveyed to date). The area as a whole forms a significant regional (and possibly national) stronghold for this threatened species. Mink predation is a threat but it may be that the amount of habitat and the complex connections within the ditch system has allowed water voles to survive. Most of the water vole habitat is under the management of Burnt Fen IDB or local landowners. Ditch management may have a major impact on water vole populations and require care and following good practice to conserve and encourage populations as well as to stay within the law. Water vole is probably the most important species to be considered by Burnt Fen IDB. Controlling mink will also encourage populations to thrive. Formerly widespread throughout the UK, the otter underwent a rapid decline in numbers from the 1950s to 1970s and was effectively lost from midland and south-eastern counties of England by the 1980s. The decline now appears to have halted and sightings are being reported in former habitats. Otters now use all major watercourses in Cambridgeshire, Suffolk and Norfolk and populations appear to be recovering. Bats are protected under Schedule 5 of the Wildlife and Countryside Act 1981. Species recorded in the Burnt Fen District are Brown long-eared and Pipistrelle Bats. The Burnt Fen District supports a significant population of barn owls, which use ditch banks for foraging. The population may be limited by lack of nest sites. This is the key habitat influenced by the Burnt Fen IDB. 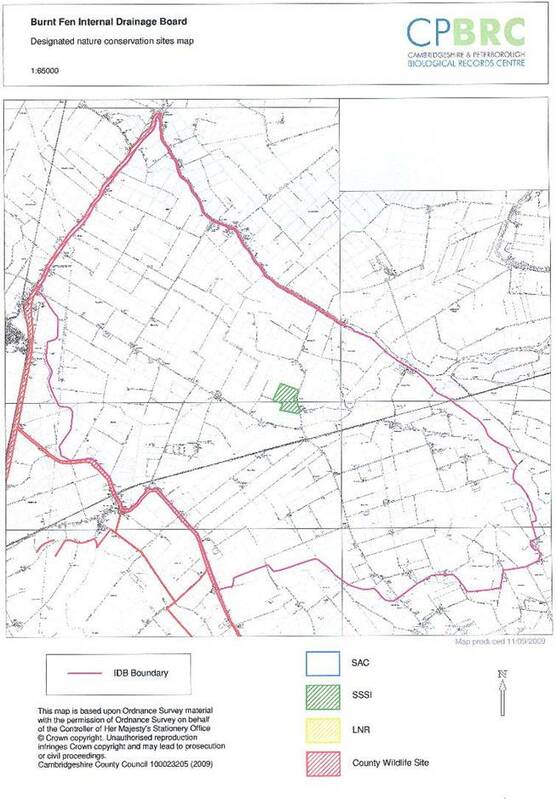 Within the area covered by this BAP, a few large watercourses are managed by the Environment Agency, the smallest drainage ditches are managed by private landowners, many of whom will be known to the IDB, and the rest are directly managed by an IDB. Monitoring of the Burnt Fen BAP will be required to ensure that the actions detailed in the habitat and species action plans are being implemented. Progress towards each of the targets is likely to be assessed annually and it is anticipated that the Burnt Fen IDB BAP will be fully reviewed after five years. However, the production and long-term development of the BAP is a flexible process. Annual reporting will be done through meetings of the Burnt Fen Internal Drainage Board and through the national Biodiversity Action Reporting System (BARS). Targets and actions for the individual action plans have been written so that they fit the national BARS, which is the approved system for reporting. Using BARS annual progress reports will be produced and made available.